Teeth bleaching or teeth whitening is one of the most common cosmetic procedures in dentistry. This procedure provides a better-looking smile and restores the natural shade of your teeth, or even provides a shade that is whiter than your natural one. White teeth are often associated with beauty, so there probably isn’t a single person that wouldn’t like to have a pearly white smile. By removing different stains and discolorations caused by extrinsic or intrinsic factors that can affect your natural teeth color, the whitening procedure will be able to remove the stains and help in improving the teeth’s color. The term teeth bleaching is associated with using bleaching products. Most of the bleaching products are based on hydrogen peroxide or carbamide peroxide. What can cause a change in the natural color of your teeth? The enamel is a transparent tooth substance that covers the dentin. The dentin, on the other hand, is a colored substance that has a great importance in determining the natural color of the teeth. The color mainly depends on the color of the dentine and the thickness of the enamel. If the enamel is thinner it allows the dentin color to show through more, and it provides a greater light reflection. But if the enamel is thicker there is less reflection and less exposure of the dentin color. The enamel contains pores in his structure and that is the main reason why different discolorations and stains can happen to the natural teeth color. There are a lot of internal and external factors that can cause discoloration of the teeth. The external factors include a lot of things that out teeth come in touch with every day. The most common ones are dark-colored drinks such as tea, red wine, soda, sports drinks, coffee, food, smoking. Another factor that can cause teeth staining is improper oral hygiene. Dental plaque and calculus are very common among people, and the color of the calculus can vary from yellow, grey, brow or even black. The chlorhexidine that is a part of a lot of antiseptic mouthwashes can also be an external factor. The internal factors are a result of a change in the tooth structure. This group of factors includes dental decay, amalgam fillings, dental trauma, antibiotics (tetracycline and minocycline), disorders, fluorosis, dentinogenesis imperfecta, amelogenesis imperfecta, enamel hypoplasia and more. Age is also a factor that contributes to teeth coloring, as we grow older the enamel becomes thinner and more translucent which allows greater dentine exposure. Where can you get your teeth whitened? There are two ways that you can get a brighter smile. The first and safer one is visiting a dentist and getting an in-office treatment. 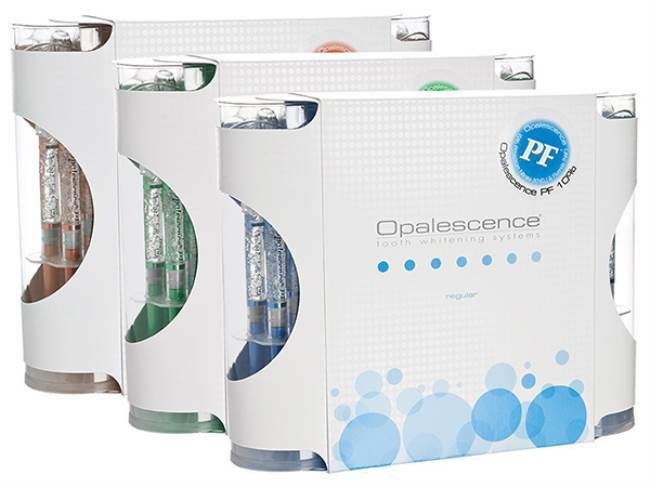 And the second one is using home whitening systems that are usually inexpensive and are becoming more popular every day. Just like it was mentioned before, this is the safest way to get your teeth whitened. Most of the dentists offer this service in their dental offices. Before getting your teeth whitened the dentist will get information on your medical and dental history, he will do a dental exam and probably will perform a prophylactic cleaning to remove all of the plaque that is present on the surface of the teeth. If there are any tooth decays, cracks or gum conditions, they have to be accessed first before proceeding with the whitening procedure. There are special shade guides that are used to measure the patient’s teeth color before the whitening and to further compare the effects and the results of the procedure. The bleaching can last for a different time and it depends on the results that the patient wants to get and on his lifestyle. The bleaching agents that are used are based either on hydrogen peroxide or carbamide peroxide. Hydrogen peroxide is almost three times stronger than carbamide peroxide so that is why it is used in solutions that contain 3%-15% hydrogen peroxide, or if the bleaching agents are based on carbamide peroxide they can contain 10%-45% carbamide peroxide. These substances have the ability to penetrate in the structure of the enamel and that is how they dissolve the stains that cause discoloration. Both vital and non-vital teeth can be treated and bleached. There are several different methods of in-office vital teeth whitening. All of these methods include placing a bleaching agent on the surface of the teeth. All of the methods last from 30 to 90 minutes, are painless and are always supervised and controlled by a dentist. The number of appointments depends on the shade that the patient wants to get, the severity of the discoloration and the method that is used. Before starting the whitening procedure, the dentist will protect your gums and the papilla by applying a light-cured protective layer or a liquid rubber dam. Other protective materials that are used are also face bibs, gauze, retractors, protective eyewear. All of this protection is needed because the whitening agents can cause damage and irritation of the soft tissues. Light-accelerated bleaching is one of the most common methods used in the everyday practice. This method uses a bleaching agent and a light energy that can come from LED, halogen or plasma arc lights and it is considered that the light will accelerate the process of whitening. The light energy should accelerate the molecules of the peroxide without causing any damage to the pulp of the tooth and causing hypersensitivity. A lot of dentists prefer not to use any light to activate the bleaching gel. There are a lot of researches that show that the bleaching systems work the same with and without being activated by light. The procedure lasts from 30 to 90 minutes, depending on the product that is used. Once the bleaching gel is applied the procedure can be divided in more cycles, and after every cycle the gel is rinsed off the teeth and a fresh gel is applied. The whole procedure can be carried out in one cycle, where the doctor only adds more bleaching gel. 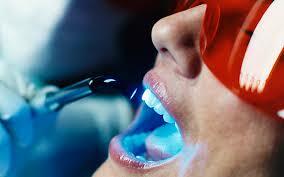 Laser teeth whitening is probably the most expensive whitening procedure at the moment. This procedure also includes applying a bleaching gel that contains hydrogen peroxide or carbamide peroxide, and the gel is activated and heated by a laser. The non-vital or internal method is used for teeth that have previously had an endodontic treatment or also known as root canal treatment. These teeth have internal stains from blood or other liquids that have colored them during the treatment or after it. With these types of stains, the external methods of bleaching are not successful. The procedure starts by properly cleaning and filling the root canals. After that the dentist places a whitening agent inside the pulp chamber and seals the tooth with a temporary filling over the whitening product. The whitening product has to be replaced a couple of times depending on the case. This method is commonly known as the “walking bleach” method. Another option for devitalized teeth is placing a bleaching agent in the pulp chamber, but the cavity is left open, and it is combined with external bleaching of the tooth. The in-office method of teeth bleaching is recommended because it is the safest way in getting your teeth whitened, the dentists are highly-professional and trained in preventing any risks and complications. After your visit at the dentist’s office and after the treatment, the dentist might also provide you with a home whitening system for you to use. He will first take impressions of your teeth and provide you with mouthpiece trays that are made based on those impressions. You will also be given a whitening gel. The doctor will give you clear instructions on how to use the whitening system, for how long and how many times a day. There are also a lot of available whitening products over the counter. These products are available as whitening toothpaste, whitening strips, mouth trays, whitening gums, paint-on whiteners, rinses and more. All of these products contain bleaching agents, but much less than the whitening agents that are used for in-office whitening. They come with instructions on how to use them to avoid any risks and complications. The latest bleaching agents include fluoride in their ingredients, which helps with hypersensitivity and increasing the enamel hardness. The fluoride combined with potassium nitrate are a great improvement in the quality of the bleaching agents because they offer a whitening process which is more comfortable for patients, relief from sensitivity and improved oral health. Ultradent is the first company that presented this technology, and their products do not need to be activated by light and are widely used around the world. Some patients might experience hypersensitivity after their bleaching treatment. This is usually only a temporary complication and it happens in the first couple of bleaching treatments. This hypersensitivity is caused by the bleaching agent, that has a very low pH, that causes the dentin tubules to open up and make them very sensitive to thermal changes. Also light activated teeth whitening is considered to increase the risk of post whitening sensitivity, mostly because of the heat that is produced. This heat affects the liquid in the dentin tubules and causes dehydration and sensitivity. To avoid hypersensitivity, the best way to get whiter teeth is to visit a dentist’s office. If there is sensitivity present, the bleaching treatments should stop and those patients can use special toothpaste that can ease the discomfort. Another thing that might happen after the bleaching procedure is to get uneven results. The teeth might be more stained in some areas compared to others. Also in order to prevent uneven staining patients need to avoid certain drinks and food that might color the teeth after a bleaching treatment. Over-bleaching can happen to people that use bleaching products very intensively. This can cause damage to the teeth’s substances and change their color to overly white and very translucent. There are some bleaching products that can cause damage to the enamel, especially if they are not used according to the instructions. The hydrogen peroxide and carbamide peroxide that are used during the bleaching are caustic substances and if they are not used properly they can cause damage and irritation to gums and oral tissues. If the tissues are not protected properly during the whitening, the bleaching agents can cause burns to the oral mucosa, and patients will feel burning sensation. Over the counter mouth trays are not custom made for every individual, so they are one of the most common reasons for tissue damage. This is why it is very important for teeth bleaching to be supervised by a professional. Some people can get addicted to this procedure, and keep visiting the dentist or keep using at-home bleaching systems, even though their teeth are white enough. This condition is known as bleachorexia. The teeth whitening procedure does not provide permanent results. Your teeth will get stained again with food, drinks, tobacco and more. If you can avoid drinking colored drinks, smoking and certain types of food the results of the procedure will last much longer. The results vary from patient to patient, but they usually need another treatment after six months or a year. If you want to maintain the results of the treatment as long as possible you have to brush your teeth and rinse after eating of drinking, you can use a whitening toothpaste, floss regularly, and avoid drinking beverages and eating food that can stain your teeth. Who should avoid teeth bleaching? People that already have sensitive teeth and gums, pregnant women, children under 16, people with gingival recession, people that have defective restorations and more should avoid this type of treatment. Another thing both patients and dentists have to take care of is teeth damaged by a cavity. Untreated decay should first be properly removed and treated with a filling before the bleaching procedure. The main reason behind this is that the bleaching agents can reach to the dental pulp and cause further damage.